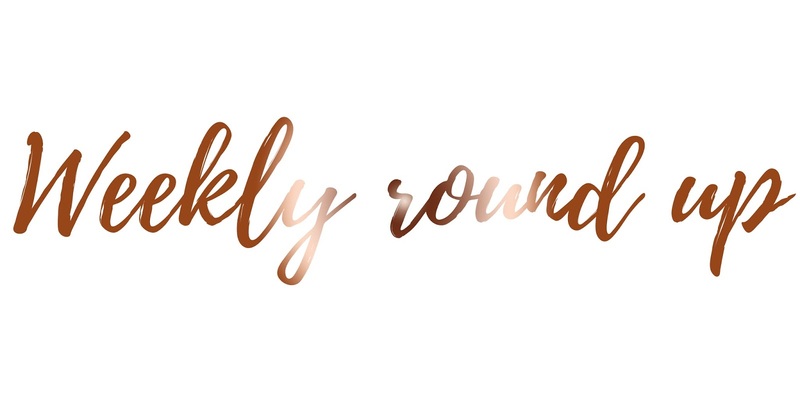 Today is another weekly round up and so much is currently going on, I cannot wait to tell you! This week I made a huge decision which will make the biggest difference to my life, my decision isn't 100% final and no doubt I'll change my mind because I'm the most indecisive person ever, but it's something which is on my mind which I'm putting a lot of consideration into. Now, I'm not going to go on about whatever that thing may possibly be in this post, as I plan on dedicating a whole post to it either this coming week, or the week after. I think it's a post which many of you may be interested in, but if you follow me on Twitter and have seen my tweets from a few days ago then you may have an idea of what I'm talking about. Although right now you have absolutely no idea what might be changing, I can tell you that annoyingly, after taking a month to decide my dissertation topic, I have now changed my mind again and I'm now having to think of a new dissertation topic for my final year; ugh! But regardless of how long this is taking me, it will all be worth it; I hope. With only three weeks left of work, I have a busy few weeks coming up till my last day before the Summer break. However, I'm hoping to find any spare time whatsoever for my blog and also for reading. I've come to realise that I do not read enough. Sometimes I'll spend a whole evening reading one book and other evenings, I'm sat there gazing into space wondering what I'm doing with my life, when I can be spending that time either working on my blog or reading a book. What a struggle my life is! Although in this time when I have sat there doing absolutely nothing, I've also realised how much blogging means to me. Now, some of you may know I would absolutely love to have my blog as an income and a full time job. Although some of us may not have this chance so we still need options. Although this may be my dream, I have other dreams too which I'd love to succeed in. So for now, I'm planning posts not only based upon what I'm interested in, but also what my readers would like to see too. As you can see from my blog I cover so many different topics because my blog is based upon my life, so if you would like to see more of a certain topic here on my blog then please either let me know through one of my social media channels, or leave a comment on this post so I know what you personally would like to see. Whether that's just a certain topic or even a suggestion for a future post; everything is welcome. This week has been spent thinking about my life and where it's going and what I plan on doing next. I'm always planning, no matter what I may be planning for. Goal making is also another part of me which I do on a daily basis; even the tiniest goals I still write down because we all need a bit of satisfaction in our life. Although I do not have any fun weeks planned ahead, I know most of my time will be spent making a better life for myself and that's completely okay! What have you been up too this week?